iCloud lets you sync and store data with your Mac, iPad or iPhone, including your bookmarks. If you have iCloud configured, your bookmarks will appear across all of your devices. This means if you update your bookmarks (e.g., adding or removing bookmarks) on your iPhone, your new bookmarks will sync between all of your Apple devices (Mac, iPhone, iPad etc). 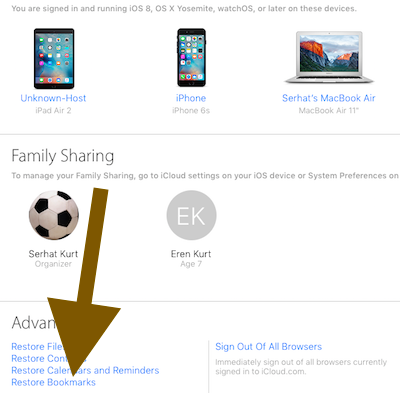 This also means that If you have deleted your Safari bookmarks by mistake, you may be able to get them back. This article explains how to recover lost or deleted iCloud bookmarks. This can be done by restoring your bookmarks. 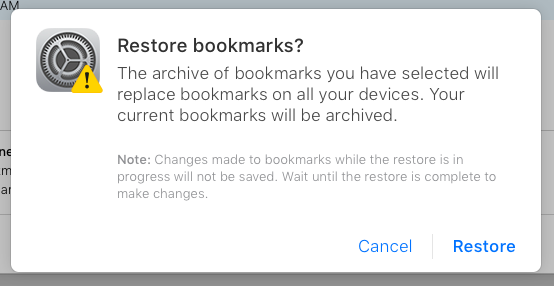 Note that you can only restore your bookmarks if they are deleted within the last 30 days. 2-Enter your Apple ID and password. 5-A new window will open. You will see your archived bookmarks. Restoring your archived bookmarks will replace your current bookmarks. Also note that restoring your bookmarks will not remove your current bookmarks. If you restore your bookmarks, your current bookmark will be archived too. Now click Restore. 6-A new information popup will appear saying: The archive of bookmarks you selected will replace bookmarks on all your devices. Your current bookmarks will be archived” Click Restore again. I chose a date from the archives that predated the loss of bookmarks (following the purchase of a new device). My bookmark bar was mostly restored, but not completely. My bookmark menu disappeared and could not be restored using any archive predating the loss of material. After a couple of tries all the pre-disaster archive dates were inaccessible. How can I restore all my bookmark material to a date last week. Didn’t work for me either. I inadvertently deleted a major bookmark folder and can’t seem to restore it. Done. Works really fine. Thank you so much…. Oh my God THANK YOU THANK YOU THANK YOU!!!! Once i figured out to go to “icloud.com” on my COMPUTER, not on my iPhone, then it was a breeze — went EXACTLY as you laid it out. The bookmarks are SLIGHTLY different than they most recently were, but I intentionally went back like 2 weeks cuz I wasn’t sure *when* they disappeared. Still better than losing ALL of em!!!!! I accidentally deleted all my bookmarks then went to iCloud and followed the directions to get them restored. It said they were but I still cannot find them, HELP! That’s very helpful, thanks so much! Thank you so much! I get back my bookmarks. Awesome. I thought I had lost a critically important bookmark folder. The folder was deleted when I was simply rearranging it on the screen and I couldn’t find it anywhere and could not “undo” the delete. The fix was simply following your instructions. Thank you.